There is great confusion in the dairy world. The farms are in crisis and they close because the price of milk is too low, the manufacturers, to meet the costs, resort to technical tricks such as excessive use of feed, pasteurization, the ferment. In this situation, the quality of the cheeses in constant decline, and therefore, the gap in prices between the cheapest and the most expensive cheese is reduced to such an extent as to be offensive to those who truly produces quality. It born from this reading of the dairy reality the proposal of Quality Classes, a method and a model that allows, to consumers, to understand the reasons for the differences in quality among the cheeses and, to the producers, to receive just compensation developed by National Association of Cheese Under the Sky. The objective of the review is to organize an area for discussion, training, information on the reasons for diversity of milk and cheese, on scientific bases that justify the differences, on the most suitable tasting techniques to capture these differences. During the days, the manufacturers who already adhere to the classes and those who want to join, delis or restaurants have embraced the model, scientists who have studied the implications, consumers who want to learn the quality. This is the first event dedicated to the world Milk, Cheese and Dairy Products promoted in Campania, that will involve manufacturers throughout the region. CHEESE IN THE CLASS the first time that in a public event will present the Quality Classes, a simple and clear method defined by the National Cheese Under the Sky, copromoter of the whole event, to define the indices of Product Quality , starting from the power quality and the environmental context of animal life, besides the characteristics of the production process. 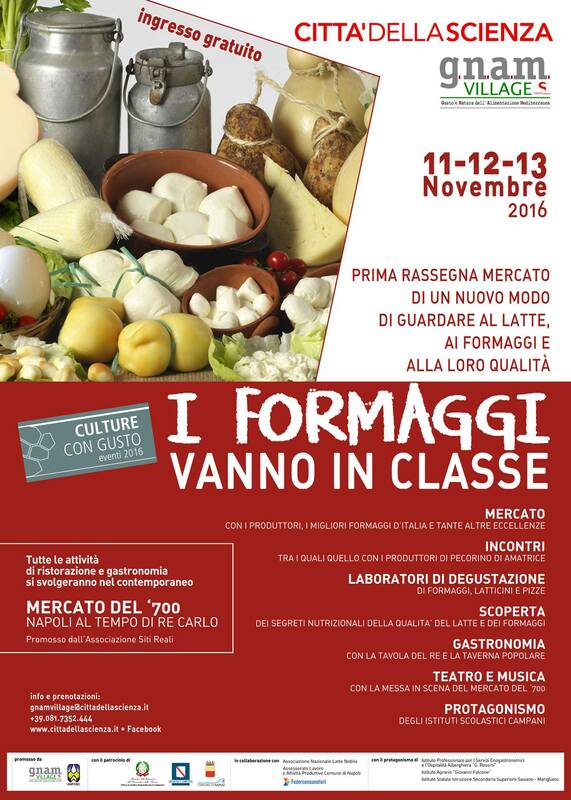 CHEESE IN THE CLASS will host workshops, events, performances and thousands of visitors will be characterized by the presence of the world of the School of Research and University. Finally, simultaneously with CHEESE IN THE CLASS, it will take place, again in the space of g.n.a.m.VILLAGE, the MARKET of the XVIIITH CENTURY THE TIMES OF KING CHARLES, one of the final events of the year dedicated to the three hundredth of the birth of King Charles III of Naples in 1700 organized by the Royal Sites.